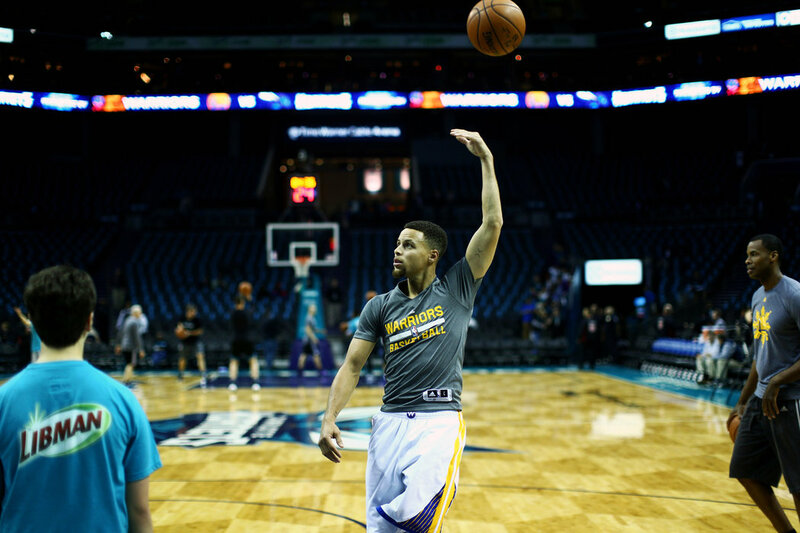 The Warriors’ Stephen Curry warmed up before Wednesday’s game in Charlotte, N.C., where he was raised and his father, Dell, played professionally. Even his pregame routine has become an attraction. CHARLOTTE, N.C. — More than an hour after Stephen Curry had turned another road arena into a cozy backyard with the friendliest of rims, he mingled with those who had come hoping for or expecting no less. And still he astonished them with a 28-point third quarter, including an exhilarating flurry of long-range exactitude, 19 points over 3 minutes 42 seconds that turned an 8-point lead into a 21-point blowout. He had blitzed the buzz out of the Charlotte Hornets with 40 points over all in a shade over 30 minutes played; 40 points on 18 shots taken, 14 made, for the Golden State Warriors, who have not lost a game since June of last season.